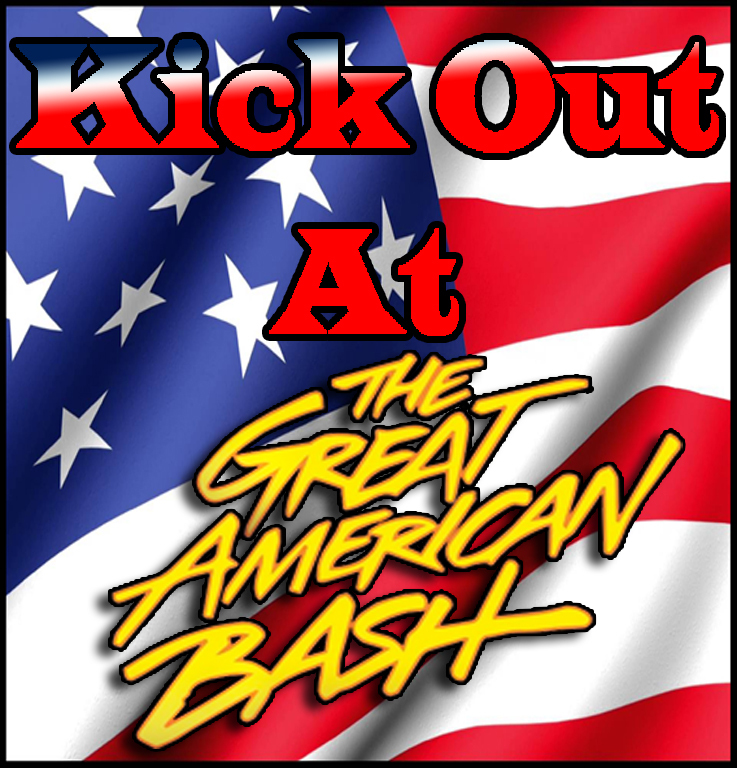 Steve McMichael | Kick Out At 2! 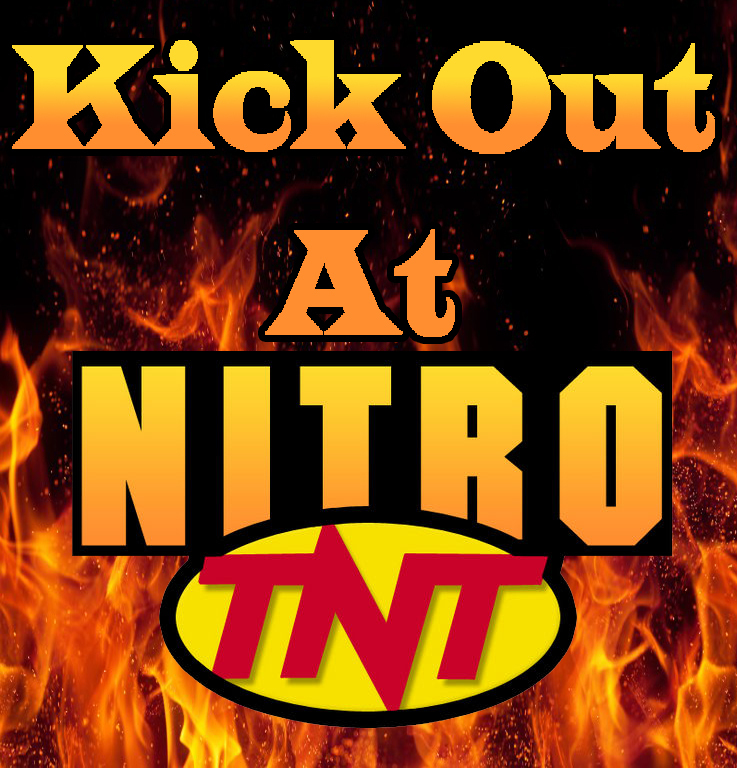 It’s time, once again, for another WCW Monday Nitro recap from your friends here at Kick Out at 2! This episode comes from Nashville, TN, and is the go home show to Slamboree. 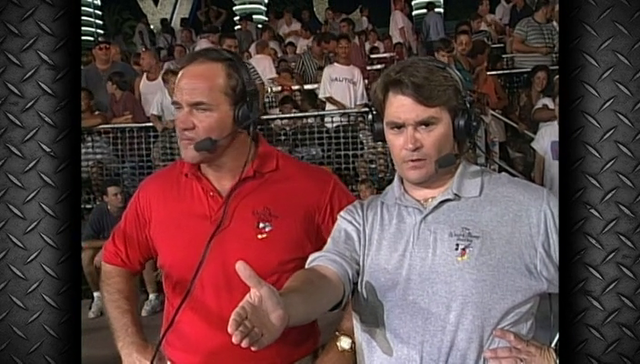 Eric Bischoff starts the night off telling us that Luger will get a THIRD title shot tonight. He missed last week and apparently missed one on Saturday Night the week before. We go to footage showing that Lex camped out last night in Nashville so that he wouldn’t miss the match tonight. Pepe is in a cape, sunglasses and Elvis wig. Public Enemy gets the jobber entrance with no music during the opening of the show. You can see them walking past the announcers during the opening. The Steiners are almost in matching gear tonight, something that usually doesn’t happen. Scott is wearing a two-tone single that is half patterned, half solid, or they would be matching. Bischoff says that Savage has been fined $50,000 for slapping and elbow dropping the referee last week and has also been barred from the building. Heenan reminds us that in six days, we’ll see the Steiners go against each other at Lethal Lottery. Tonight, though, they’re in tandem, as Scott starts off with Rocco Rock, gorilla pressing him into Grunge and setting them both up for a giant double Steinerline from Rick. Public Enemy regroup outside and Scott tags out to Rick. Grunge gets a few punches in but Rick catches him on an Irish whip and carries him over with a suplex. I love that Rick Steiner catch suplex. Scott tags in, Irish whip, belly to belly suplex! All four men go to the floor. Public Enemy bring Rick back in, trying to set him up for a double team, but Rick moves and Rocco nailes Grunge. Rocco goes up top but Rick hits the rope, crotches him on the top and suplexes him off before tagging out to Scott. Scott hits a tilt-a-whirl slam and takes Rocco Rock up top. Grunge slams Steiner down and Rocco hits a dive off of the top before tagging out to Grunge. Bischoff says that Mongo had a run-in with Ric Flair backstage last week. Mongo starts to talk about it but just plays it off, saying there’s something in the works. Grunge goes for a flipping senton to Scott Steiner, but Scotty moves and Grunge eats canvas. Scott tags out to Rick, who gets the hot tag with two clotheslines to both members of PE and then two belly to belly suplexes. Bischoff tells us that on May 27th, Nitro will start at 8 PM and go for TWO hours! My work load doubles in just a few days it seems. Back in the ring, Scott Steiner sends Rocco Rock to the ropes, FRANKENSTEINER! Commercial break and back for our next match. Bischoff mentions that on Saturday Night, we saw the return of Diamond Dallas Page. They mention that now he has a “benefactor.” He got an attorney, a limo, a new outfit, and thanks to a loophole, he’s back! This is the DDP angle I remember, finally! Benoit and Taylor start off locked up and going all the way around the ring. Taylor goes for the leg but Benoit rolls out. Heenan tells us that Benoit is a bit pissed at Arn Anderson now and he’s really angry at Kevin Sullivan, who he blames for the breakup of the Horsemen. Heenan says that Benoit got in the faces of both Anderson and Kevin Sullivan and even Anderson took a step back. 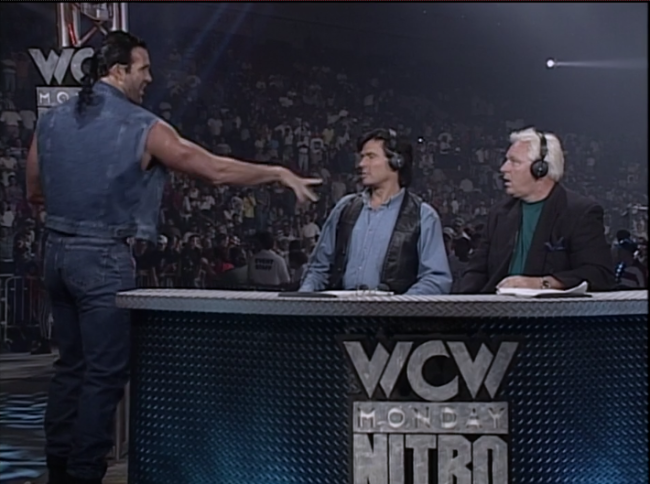 Bischoff pulls a Poochie the Dog and says hello to Hulk Hogan. In the ring, Benoit has turned the match towards his pace, taking over, slamming Taylor into the turnbuckle and hitting a hard chop. Whip to the corner and Benoit charges in, but Taylor moves and meets Benoit with a European uppercut, sending Benoit to the floor. Taylor follows and beats down Benoit on the floor a bit. Bischoff lets us know that “Hard Work” Bobby Walker was injured and now DDP is in the Lethal Lottery. Benoit goes up top but Taylor catches him, dropping him to the mat and then following up with a fall-away slam for two. We hear that Randy Savage is outside. Mongo says he wants to talk to him and bolts. Benoit hooks a full nelson…Dragon Suplex for the win. Back from commercial, we’re outside with Mean Gene, Doug Dillinger, Mongo, and Macho Man. Macho is angry that he can’t get into the arena, but Mongo runs out and says that Flair has another enemy. He tells Savage to chill out because he’s got a plan. Gene tells Savage that he’s lost his mind. Savage says he’s going to take WCW and turn it upside down. Savage says he doesn’t care about the money. Gene tells Savage that he’s got to partner with Flair at Slamboree. Savage says he has no problem dragging a dead tag team partner to the ring and winning the Lethal Lottery by himself. Gene says that WCW has advised Savage to seek professional help. Bischoff says that he’s heard a lot of talk about Mongo and Kevin Green, formally of the Green Bay Packers, now of the Carolina Panthers. Mongo says that there’s a plan, but he’s not going to tell us about it where Flair can hear about it. Flair and Wallstreet start off pretty evenly matched. Wallstreet pretty much takes over the match, though, although through means that aren’t super impressive. This isn’t a bad match in any way, but it’s one of WCW’s weird heel VS heel matches that no one can really get into. If anything, Flair’s probably more over since it’s in Nashville. Wallstreet just has no damn charisma as this character. Wallstreet hits the Samoan drop he uses as a finish but only gets two when Woman puts Flair’s foot on the ropes. Wallstreet is wrestling like a babyface, honestly. Clean, scientific, and only on the losing end due to the ladies in Flair’s corner. Wallstreet goes for a kneelift outside while Flair is leaning on the post, but Flair moves and Wallstreet takes the post knee first. Flair wraps Wallstreet’s knee around the ring post a few times and then locks on the Figure 4, with Woman giving him leverage. Gene meets up with Flair and the ladies over at the VIP section. Gene says Flair isn’t doing much to endear himself to Nashville. Flair says Nashville hasn’t seen him since he made Dolly Parton ride Space Mountain. Flair says he heard Savage say he would drag a dead man to the ring. He started kissing Liz up and down her arms, making her visibly uncomfortable. Woman plays this role SO much better than Liz. Liz just looks like a deer in the headlights during these segments. Gene brings up Debra McMichael. Flair says he stayed up all night, throwing touchdown passes, then grabs the ladies and says “look at my wide receivers!” I love the constant idea that Ric Flair is banging these women nightly. Both men get the jobber entrance as we start with referee Nick Patrick raising the title and starting the match. Giant starts off clotheslining the crap out of Luger. Luger ducks a third clothesline and attempts to bodyslam The Giant, but Giant shoves him off and sends him out to the floor. It’s been a while since we’ve seen Lex hang out on the floor for most of the match, hasn’t it? Guess we’re getting ready to turn him full babyface soon so we gotta stop that. Lex comes off the top but Giant catches him and slams him into the corners a few times. Giant sends him into the corner and chokes him with his boot. Lex ducks a couple of clotheslines and fires him back with the bionic forearm to no avail. Bischoff says that was the forearm that took out Yokozuna and left him laying for ten minutes. Interesting to hear Bischoff talk about a WWF guy by name and it not involve ruining Raw results. Quick cut to the VIP section, which is a table setup off of the ring, where Flair and the ladies are eating and drinking. Lex tries the forearm again to no avail again. Giant takes Lex over to the VIP section, clears the table, and choke slams Lex through the table while Flair goes ballistic. He and the ladies hightail it, though. Nick Patrick calls for the bell to end the match while Jimmy Hart tries desperately to reign in The Giant. Sting runs out to help Luger as The Giant finally heads to the back. Gene tries to go over to where Luger is and Sting yells at him and tells him “not now!” The end of the match is replayed to absolute silence. Heenan asks when the last time we saw Lex Luger manhandled like this. Bischoff says that if Sting needed motivation for the title match at Slamboree, he has it now. Heenan says that Sting can’t go into the match thinking about Luger. He needs to go in thinking about his own body. Bischoff sends us off the air selling Slamboree. Another really good episode. Slamboree, and more importantly the Lethal Lottery, is a hard sell since none of the teams are normal partners. The only match they can really sell is Giant VS Sting, so they spend the Luger match building up to that. They’re pushing certain story lines through the Lethal Lottery, like DDP, Benoit and Sullivan, Flair and Savage, and the Steiners wrestling each other for the first time, but they didn’t spend a lot of time really building up to the Lethal Lottery itself. I would have liked to see some more interactions between these makeshift teams. Or, if you’re not going to let them wrestle before Lethal Lottery, just toss out a throwaway line mentioning that the WCW Championship Committee has ruled that none of the teams can partner up BEFORE the Pay Per View. There, taken care of. I’m interested in Slamboree because of the Lethal Lottery concept, but that’s about it. I’m certain Sting VS Giant will be an okay match. I am interested to see the Cruiserweight title match to see who is getting the shot. All in all I’m intrigued, but in all honesty, I’m mostly intrigued for what is coming in two short weeks (in 1996 time) on 5/27. I’m gearing everyone up for that so I’m getting excited to see what my fellow Ko@2 members have to say about that show. Join me back here soon (within the next day or so) for Slamboree! Until next time! Nitro up a little, Raw down a little, but still a full point+ victory for Vince. HBK and HHH looks like it could be a really good match, especially going 20 minutes. Interesting to see HHH getting the main event on a Raw after the Curtain Call at the Garden, though. Of course, he loses to the champ, but that’s to be expected, de-push or no.